David Levine’s Some of the People, All of the Time examines the fragility of our democracy. It confronts a timely and disturbing question: What if a member of a gathering—a rally, an audience, even a party—is there under false pretenses? Recently, there have been a number of disturbing revelations about this kind of dishonesty, such as paid “protesters” infiltrating demonstrations, the proliferation of fake Facebook and Twitter accounts, and accusations of “crisis acting” in the media. In each case, feigned and fabricated identities—or even invoking the “fake” as a means to undermine a given stance or action—are being deployed for political gain. Probing the psychological underpinnings of this alarming reality, the centerpiece of Some of the People is a new performance enacted by a rotating cast, addressing issues of personal identity, agency, labor, and suspicion. Inside the gallery-as-stage-set, amid an installation of artworks, Levine crystallizes an unsettling distinction between different modes of acting: wary of an actor’s talent for deception, we are most comfortable when their performances occur on obvious display—not invisibly, and ominously, within a crowd. In witnessing the emotional inner life of one such “fake person,” visitors will wrestle first-hand with what a person is and how they act—demographically, politically, existentially—in today's society. The performance will be viewable on Thursdays between 2 and 9 pm, and on Fridays, Saturdays, and Sundays between 1 and 6 pm. On first Saturdays (June 2 and July 7), it will be performed between 2 and 9 pm. It lasts approximately 45 minutes. Performances are not timed, ticketed, or seated; visitors may enter and exit the gallery freely during all Museum hours, including Wednesdays. David Levine: Some of the People, All of the Time is organized by the Brooklyn Museum and co-presented with the Onassis Cultural Center New York as part of Birds: A Festival Inspired by Aristophanes. 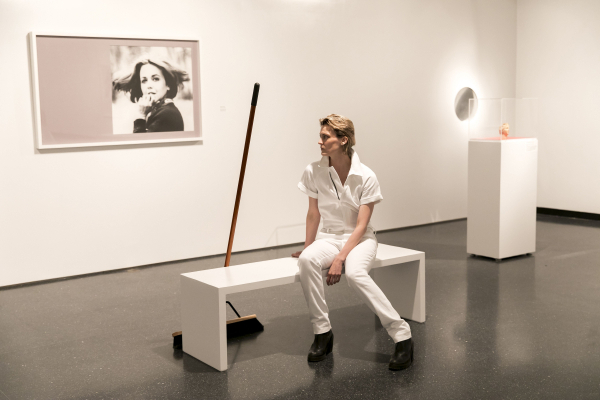 It is organized by Sara Softness, former Assistant Curator, Special Projects, Brooklyn Museum.